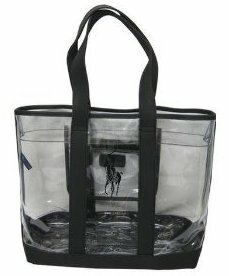 Transparent totes are an affordable and easy-clean way to give any outfit a distinct look. This pony bag is Ralph Lauren's attempt at the popular style. As clear handbags go, this one is a little lacking in pizazz. The black and clear color scheme is a little conservative, and Ralph Lauren's pony player screenprint is predictable. But for fans of the brand, the use of that iconic image alone will be enough to boost the bag's sales. The open top design allows for easy access, but security is a concern. The zippered pocket gives us a safe space to stash smaller valuables, but what about our wallet? Maybe that's best left at home, or wrapped up in a beach towel away from prying eyes. It's not specifically marketed as a beach bag, but transparent totes always seem more suited to this purpose than any others. So it may not see much action outside of summer, but at only $48 this Ralph Lauren bag still represents good value for the label's many admirers. The Tepper Jackson Samba bag, a colorful alternative to this clear bag.